“If I find a Ukrainian who is worthy of sitting at the same table with me, I must have him shot,” declared Nazi commissar Erich Koch. To the Nazi leaders, the Ukrainians were Untermenschen—subhumans. But the rich land was deemed prime territory for Lebensraum expansion. Once the Germans rid the country of Jews, Roma, and Bolsheviks, the Ukrainians would be used to harvest the land for the master race. Karel Berkhoff provides a searing portrait of life in the Third Reich’s largest colony. Under the Nazis, a blend of German nationalism, anti-Semitism, and racist notions about the Slavs produced a reign of terror and genocide. But it is impossible to understand fully Ukraine’s response to this assault without addressing the impact of decades of repressive Soviet rule. Berkhoff shows how a pervasive Soviet mentality worked against solidarity, which helps explain why the vast majority of the population did not resist the Germans. He also challenges standard views of wartime eastern Europe by treating in a more nuanced way issues of collaboration and local anti-Semitism. 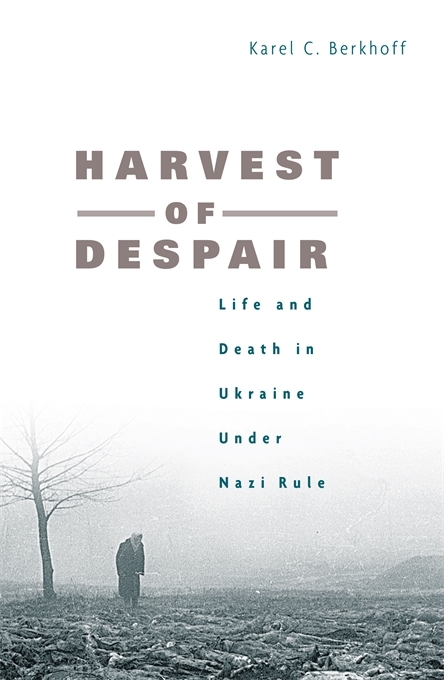 Berkhoff offers a multifaceted discussion that includes the brutal nature of the Nazi administration; the genocide of the Jews and Roma; the deliberate starving of Kiev; mass deportations within and beyond Ukraine; the role of ethnic Germans; religion and national culture; partisans and the German response; and the desperate struggle to stay alive. 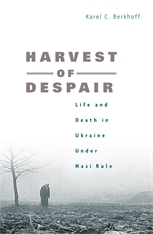 Harvest of Despair is a gripping depiction of ordinary people trying to survive extraordinary events.